Sub: Conducting of Agitation Programme for settlement of Charter of Demands of Defence Civilian Employees – reg. INDWF being one of the constituent organisations of National Council (JCM) under the National Joint Council of Action (NJCA) of Central Government Employees. NJCA deferred the proposed Indefinite Strike which was to commence from 11.07.2016 based on the assurances given by the group of Ministers Chaired by Shri Rajnath Singh, Hon’ble Home Minister that Government will constitute committee on on Minimum Pay, Fitment Formula, Allowances, NPS and Pre-2016 pensioners. It was also the National Council (JCM) within 4 months. However, even after more than 6 months it is regretted to note that none of the demands of the NJCA pertaining to 7th CPC are accepted by the Government Employees in genera and Defence Civilian Employees in particular. In addition to the above, it is to be pertinent to mention that the Government is going ahead very fast to privatise and outsource the entire defence production activities. We are in dark about the development which is taking place about the letter received from Hon’ble Prime Minister’s office to the Department of Defence Production and OFB asking various information’s of the production activities of the above unhelpful attitude and decision of Government of India and Ministry of Defence, the Defence Civilian Employees are very much agitated in this regard. 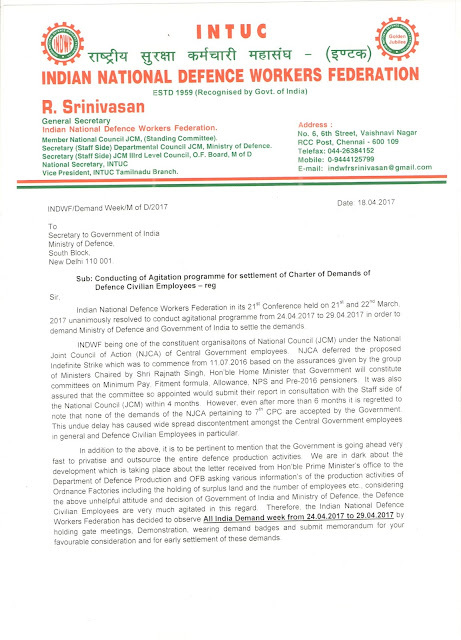 Therefore, the Indian National Defence Workers Federation has decided to observe All India Demand Week from 24.04.2017 to 29.04.2017 by holding gate meetings, demonstration, wearing demand badges and submit memorandum for your favourable consideration and for early settlement of these demands. 2.Fill up all the existing vacancies including freezed vacancies during the period of ban on recruitment considering the increased work load. 3.Withdraw NEW PENSION SCHEME (NPS) for the Defence Civilian Employees and extend Defined Pension facilities at par with Armed Forces personnel as per CCS Pension Rules 1972 ensuring 50°/o pension on the last pay drawn and also extend Family Pension. Disability pension. 4.Regularise all the Casual. Contract, Outsource employees, Part time employees employed in permanent and perennial jobs. 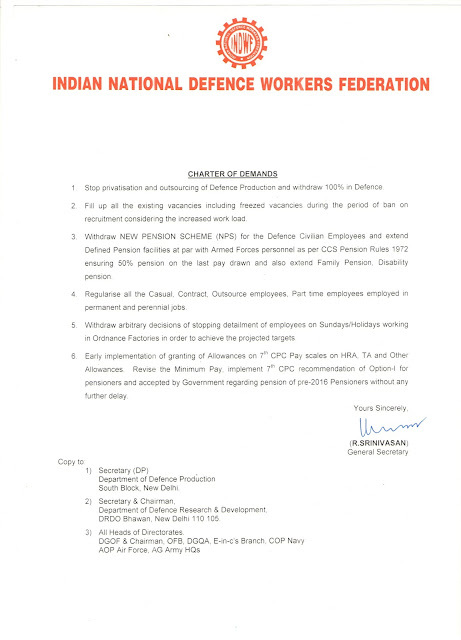 5.Withdraw arbitrary decisions of stopping detailment of employees on Sundays/Holidays working in Ordnance Factories in order to achieve the projected targets.